Well, it seems like it was yesterday, but 12 weeks have past since the release of Magnetoid. The numbers at June 24th say it has 1,529 current installs and a total of 4,286 downloads. Those are big numbers for us, first-timers and lazy-marketers. fettspielen.de “Schließlich kann man solche in-Game-Ansagen wie ‘You tap like a cow!’ doch nicht auf sich sitzen lassen.”. Well, I’d like to point out that our marketing strategy was… well, we had none! We just emailed some magazines and posted in message boards to get some feedback. I think we also bought a review once, just for trying, but didn’t make much difference since it was not supported by other actions. 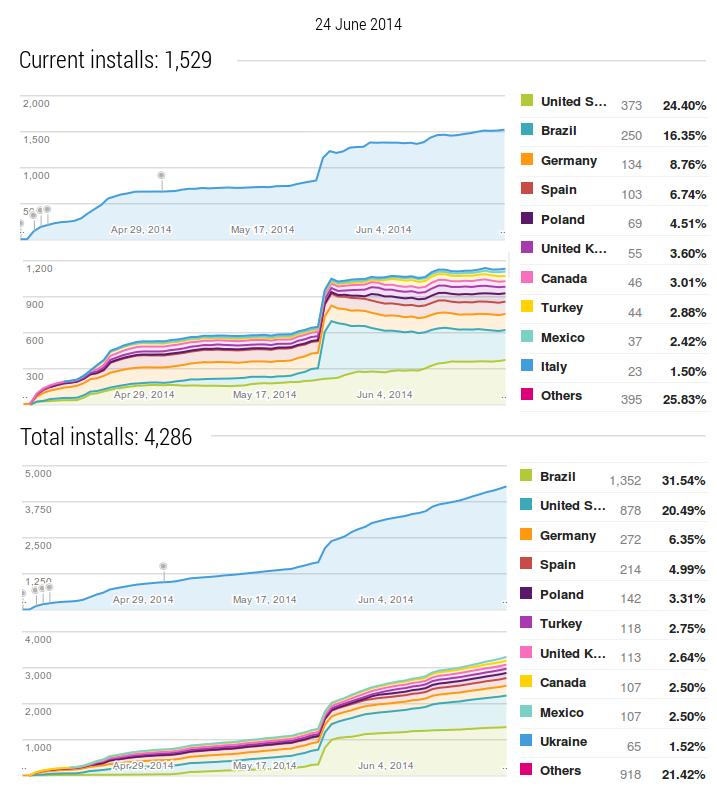 In most cases we noticed a direct connection between our actions and the increase of installs, but for one special event: a massive install increase in Brazil that surprised us. Almost 500 Brazilians installed Magnetoid in a single day! Maybe it spread by word of mouth, maybe we were a hit in their social networks, or maybe it was this post at baixaki.com.br that we just found; anyway we’re very happy about it. Probably, the fact that we localized the game in Portuguese helped a lot too. So, write down 100 times: localize your games! Back to work, you soft lazy Earthling!! Tagged android, development, game, game design, google play, magnetoid, mobile, projects, room247studio.